We’re now going to take a look at native audio recording in the browser using the Media Recorder API – a W3C standard. As of this writing the MediaRecorder API spec is in editor’s draft. What’s cool about the Media Recorder API is that its built-in browsers so your web app will not make any extra HTTP requests or spend time loading external JS libraries. This gives you about 75% coverage on desktop (IE, Edge and Safari do not support the standard) and 62% coverage on mobile (Safari on iOS does not support it). On Safari we might have to wait until Safari 13/iOS13. The API has NOT been announced for Safari 12/iOS 12 due later this year. This issue on bugs.webkit.org tracks the MediaRecorder API implementation in WebKit/Safari, if you need this API jumping in and leaving a comment will go a lot towards showing Apple developers we need this feature. On the other hand, WebKit is an open source project so anyone with mad skills can jump in and contribute. On Edge the API is under consideration for implementation with 967 votes. On Safari 11 (on both macOS and iOS) and Edge you can use this neat polyfill. It enables you to record uncompressed pcm audio in wav containers through the same MediaRecoder API. 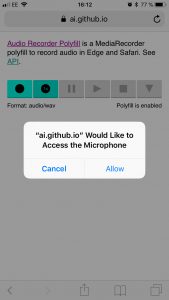 With the polyfill you’ll have about 83% coverage on desktop (IE would still not be supported) and 90% coverage on mobile when recording audio. Chrome and Opera will record mono channel Opus (default) and pcm (wav, uncompressed) audio at 48kHz in .webm (Matroska) containers. Firefox will record mono Opus audio at 48kHz in .ogg containers (.webm is supported starting with Firefox 63). Firefox used Vorbis for audio recording in the 1st implementations but it moved to Opus since. I’ve also noticed Firefox will record stereo audio (2 slightly different channels) when recording from a stereo capable recording device like the Logitech C925e or C920 (both have dual mics) or the 15″ Touch Bar MacBook PRO (3 mics). In terms of controlling the bitrate, the MediaRecorder API spec lists the audioBitPerSecond property but it is not supported at this time by any browser. In terms of controlling the sample rate, one can specify it through the sampleRate audio constraint in getUserMedia() but it is not supported at this time by any browser. To check whether or not a browser supports a certain file format or audio codec when recording audio you can use the MediaRecorder.isTypeSupported() function. This function 1st appeared in this article by Sam Dutton and was later introduced in the MediaRecorder API spec. Chrome .webm Opus "audio/webm; codecs=opus"
Opera .webm Opus "audio/webm; codecs=opus"
It’s worth noting that Chrome produces a .webm file without any metadata about the duration of the recording. Such files, with no length information, will not be immediately seekable. The full discussion is in this Chromium bug report. Long story short the length metadata should be at the beginning of the file but the length info is not avb. when the 1st chunk is recorded. Firefox seems to have addressed the issue somehow.